Dragonslayer is a difficult score for someone like me to review, and this is why: it’s because I’m not a musicologist. You can’t review scores as intellectually challenging and musically complex as Dragonslayer in the usual way, because it’s not a standard score: despite being a fantasy film set in an ancient world of dragons, sorcerers, kings, and damsels in distress, the music is about as far removed from the genre conventions as one can imagine. I don’t have the musical vocabulary, or a deep enough knowledge of the compositional techniques Alex North employs in this score, to be able to do it justice, and any attempt by me to describe it in the usual emotional terms would be laughably futile. So let me begin with this: Dragonslayer is one of the most challenging, difficult, complicated, infuriating, disturbing, chaotic scores you are ever likely to hear. It’s also quite brilliant. 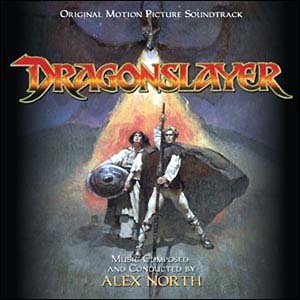 Dragonslayer was released in 1981 at a time when sword and sorcery epics were de rigueur again in Hollywood; it came to theaters at around the same time as films such as Conan the Barbarian, Krull, Excalibur and Rankin-Bass’s animated Lord of the Rings, and was an attempt to build on the new special effects wizardry George Lucas initiated with Star Wars four years previously. Directed by Lucas’s old college buddy Matthew Robbins, it starred a pre-Ally McBeal Peter MacNicol as Galen, a callow youth who through a combination of his own misguided braggadocio and terrible bad luck, is tasked with ridding Urland, his barren, rain-sodden homeland, of Vermithrax, a gargantuan dragon that has been terrorizing the countryside for decades. The film also starred the late Caitlin Clarke as spunky heroine Valerian, Ralph Richardson as the wizard Ulrich, Peter Eyre as the ineffective king Casiodorus Rex, and John Hallam as the king’s brutish henchman Tyrian. Even in the early 1980s Alex North was an odd choice to score a film like this. Enormously well-respected by his peers and already the recipient of 13 Oscar nominations, North was best known as the man who brought progressive jazz to Hollywood via his groundbreaking 1955 score A Streetcar Named Desire, and for his subsequent work on intelligent, respected films of the 1950s and 60s such as Spartacus, Cleopatra and Who’s Afraid of Virginia Woolf. North was actually recommended to director Robbins by Steven Spielberg, another old college buddy, and who had admired North for years, and so ended up in London in the spring of 1980, conducting the National Philharmonic Orchestra in what would ultimately be his one and only effort in the fantasy genre. To say that Dragonslayer is an unusual score is an understatement of staggering proportions. It’s a score that growls with brutal brass chords, shrill woodwind writing, curiously skewed and tortured thematic fragments, atonal explosions of noise, and then frolics along with a bright, breezy almost comedic scherzo that has the potential to sound ridiculously out of place. It’s a dark score – necessarily so, to reflect the unforgiving and desolate world in which the film takes place – and it’s almost entirely devoid of warmth or compassion, further illustrating the forbidding nature of Galen’s relationships with the other characters, and the devastating enormity of his task. The music is harsh and violent, dissonant and chaotic, and is steeped in a curious combination of early church music and medieval plainsong with almost defiantly impressionistic and modern compositional techniques that recall the classical works of Prokofiev and Stravinsky. It’s also full of themes and motifs, but North intentionally disguises them, sometimes playing two or three of them simultaneously in the same cue in a sort of über-counterpoint that increases the sense of aural chaos and disharmony. North also creates some astonishing instrumental combinations, blending wooden drums, harpsichords and glittering chimes with clarinets, piccolos, trombones and tubas performed at the lowest possible end of their respective registers. The rhythmic ideas are spiky and oddly-metered, giving the whole score an offset, unbalanced feeling, while the performance techniques often require the instruments to play radically out of their familiar comfort zone, either too high or too low, which makes the score sound as though it is full of errors, performed by musicians who can’t hit the right notes. Critics of this score often accuse North of having written music at random, throwing together musical styles and thematic fragments, making it sound like a jumbled and incoherent mess. Well, yes, it does sound like a jumbled and incoherent mess, until you actually sit and listen to it and try to understand what North was doing, at which point you realize that this music is as far from ‘random’ as it is possible to be. An unexpectedly playful harpsichord-led motif for the talisman that holds the key to Ulrich and, eventually, Galen’s power first appears in “The Amulet” and later crops up in fragmented form in several cues thereafter. The amulet theme is also the basis for the film’s most prominent musical element, the “Forest Romp”, a circus-like scherzo for trilling brasses, rolling snares and dancing woodwinds that also plays in the frantic “Galen’s Escape”, in vicious counterpoint to the Urland theme in “Burning Village”, and again over the film’s end credits. This is the cue which polarizes listeners the most; the peppy, almost insanely upbeat little march was intended by North to juxtapose the darkness and anguish on-screen, and provide some sort of subversive commentary on the nature of men and beasts, whimsically ruminating on which one is really the monster. However, the fact that the music elicited comedic laughter rather than thoughtful contemplation meant that much of North’s intended music for the finale, a lot of which was based on this style, ended up being cut from the finished film, replaced instead by darker, more brutal music from elsewhere in the score. Thankfully, there are one or two moments of more lyrical music, beginning with the reflective, mournful lament of “Hodge’s Death”, moving on through the liturgical “Jacopus Blasted”, and eventually embracing the romantic relationship between Galen and Valerian in “Still a Virgin” and the lovely “Dejection”, a hesitant waltz-like theme with a clear Golden Age edge to the strings. The one obvious action cue, “Tyrian-Galen Fight”, is a percussive cue for pounding timpani and low brass and woodwinds chords, punctuated with shrill blasts of the amulet motif. The two cues you would expect to be all-out action, “Dragon Sore-ing” and “’Tis the Final Conflict”, actually contain some unexpectedly elegant waltz-like variations of the amulet theme that play like variations on the similar waltz music North wrote for 2001: A Space Odyssey twelve years previously, and would have provided an unusual musical counterpoint to the film’s rousing finale had they been kept intact. It may sound condescending to say this, but I’m going to say it anyway: you really have to have been listening to film music for a while, and to understand a little about more experimental scoring techniques, in order to get anything from Dragonslayer. It was years before I finally understood what it was all about, having previously dismissed it as “noise”, and now that my musical experience and depth of knowledge is a little greater, I can finally appreciate North’s score for the masterpiece it is. But be warned; this is NOT a score for everyone. Listeners with aversions to great dissonance and disharmony will not be able to stomach some of this score’s more challenging passages, and will find some of the more experimental collisions of sound difficult to digest. However, anyone with an ear for film music that stretches itself, intellectually, conceptually, creatively and technically, will find much to admire and enjoy. The score was originally released in extremely limited numbers by the Southern Cross label in 1990, and quickly became a collectable item. This new release on the indispensible La-La Land label is limited to just 3,000 units, but features spectacular digitally remastered sound by Michael Matessino, in depth and enlightening liner notes by Jeff Bond, and handsome production values courtesy of Dan Goldwasser, Mike Gerhard and Matt Verboys. It’s an essential purchase for any serious film music collector. Music composed and conducted by Alex North. Performed by The National Philharmonic Orchestra. Orchestrations by Henry Brandt. Recorded and mixed by Eric Tomlinson. Edited by June Edgarton. Score produced by Alex North. 2010 release produced by Dan Goldwasser. This is the most difficult score ever to review! Such a pity it was nomianted against Chariots of Fire and Indiana Jones. I picked this up at Creature Features in Burbank at a CD signing (can’t remember if it was Mancina’s Twister or Shearmur’s Sky Captain and the World of Tomorrow) and listened to it that week and thought to myself what a dense, difficult piece of music to listen to. I really didn’t get anything out of it at all, though I intuited that, being the work of Alex North, it MUST bear fruit when proper attention is devoted to it, and I tabled it until I was prepared for more active listening experience. That time has come this week. I’ve listened to it with great attention twice, in background about six times, and again one more time while reading your review. What a score! No, not for everyone, and I wouldn’t even say that it’s especially rewarding even for those who “get” it. Except, it’s intellectually brilliant and pulling it apart and teasing out all the disparate pieces and observing how he plays them all against each other… perhaps not rewarding, but definitely worthwhile? Hard to put into words. On one level, I really don’t like it, but on another, I truly love it. I can’t stand the music from Dragonslayer, there are so many games which have far better.